Within a debate, it was suggested that the A9 be extended along the north and West coasts of the Highlands, and that a bridge should be built at Ballachulish. The Minister of Transport was asked about the number of moorings maintained in Ballachulish Bay and how much they were used. He replied that there were 7 and that two had been used by ‘laid up’ merchant vessels. One from 14/6/1958 to 21/9/1959 and the other from 1/5/1959 to 4/7/1959. The Glasgow Herald reported in 1962 that the combined traffic of the ferries at Ballachulish, Kyleakin and Kylesku was over 300,000 in 1960. Again, it is reasonable to suppose that somewhere around half of this was at Ballachulish. A few years later, in 1965, traffic volumes at Loch Leven were estimated at around 3000 a day, between the ferry and the road through Kinlochleven. This equates to around a million vehicles per annum, suggesting a substantial increase in a mere 5 years. At the start of the 1960s, the new housing program for Ballachulish was in full swing, with the old white row along West Laroch being cleared in favour of the new Bungalow style County houses. Croft Road was also redeveloped, to replace the temporary prefabs that were quickly erected after the war. Two more houses were squeezed into the Square in Loanfern, replacing one of the wings of the former Mechanics Institute. The Minister of Transport was again asked about the moorings in Ballachulsih Bay, and their costs. He replied that there were still 7, none had been used since the dates reported in the earlier question in 1960, and that the maintenance amounted to £7,000 a year. Charges for ships using them were £35 per week, reducing to £15 per week after 6 months. The Minister of Transport was later asked whether there were plans to remove the unused moorings. He replied that they were not there primarily for peacetime, and that he welcomed the lack of use. It was then asked if they could not be lifted and stored elsewhere, only being laid out when required, but he replied that it had been considered and would take too long. The questioner was not satisfied with the answers he received! The information centre and filling station at Glencoe was opened in time for the main summer season, and was a joint venture between the National Trust for Scotland, Shell and Scottish Oils amongst others. The project was one of 10 information centres opened in early 1962, with at least 10 more planned by the end of the following year. That in Glencoe was known as the ‘Claymore’ and the site is still a filling station, even if the information centre and NTS have moved on to new homes. 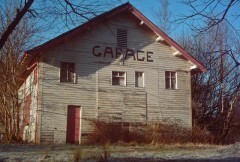 The Engine Shed at Ballachulish, which allowed engines to be stabled overnight in the village and so work an early morning train to Oban was closed. Whether this saw the immediate cessation of engines remaining in Ballachulish overnight or whether they were left in the open is unclear. It appears that this was done in conjunction with the clearing of the neighbouring goods yard, following the closure of the quarries in 1955, and the site was subsequently sold to the Chisholms, in 1967, with the former engine shed being converted to a garage. A turntable previously sat to the west of the shed, and it is believed that the pit survives, albeit filled in. The MacBraynes Bus depot at the bottom of West Laroch at Ballachulish was home to 2 buses in the early 1960s, although with 5 in Kinlochleven it is clear that this was a very small depot. The rival local business of MacConnachers, originally based at the Brecklet Garage and later in the West Quarry may have played a part in this. The MacBraynes building was only taken down in 2008 to make way for the two new houses opposite Lyn Leven. Within the many pages of the report ‘The Reshaping of British Railways’ which was drawn up under the supervision of Dr Beeching, is a recommendation for the closure of the branch line from Connel to Ballachulish. Indeed, at the time all of the West Highland Lines including those to Oban, Fort William, Mallaig and Kyle of Lochalsh were earmarked for closure. The Minister of Transport was asked about proposals for replacement bus services to parallel the 122 miles of track that were due to be closed and didn’t already have an existing bus service. His reply detailed the lines affected, which included the 27¾ miles of the Ballachulish Branch line, and stated that the need for the provision of alternate bus services fell within the existing relevant acts. The Secretary of State for Scotland was asked about road schemes costing more than £100k which had been started in the year up to 31/3/63. His reply included a section of the A828 from Kentallen to ‘Hospital Bridge’ which had started in April 1962 and was due to be completed by the end of 1963, at an estimated cost of £120k. The 1963 edition of the AA Illustrated guide to Scotland lists Ballachulish’s population as still being 727, just as it was in 1937. This is presumably the most up to date accurate figure available. North Ballachulish is given at 120, curiously the same as it was a decade later. The cost of taking a car across the ferry in 1963 was between 4s (20p) and 7s (35p) depending on length. The cost of pedestrians is not noted, unfortunately. There was a lengthy debate regarding the Connel Bridge and the profits taken in the tolls, and what the future held for the bridge if / when the railway closed. There was some amusement that even though British Rail was state owned, the ministry of transport could not give details as to the finances of the branch, or the bridge. Other comments which arose in the debate were that if passenger services were removed before freight, then delays at the bridge could mean the schoolchildren were often late to school. It was also noted that if the bridge were to close to road and rail traffic, then it was over 100 miles to use the alternative route across Rannoch Moor! The Secretary of State for Scotland was asked about proposals for building a bridge. He replied that he was considering recommendations for improving the ferry and replacing it with a bridge. The Secretary of State for Scotland was asked if he could provide the latest traffic figures for vehicle movement both across the ferry and through Kinlochleven. With the caveat that a significant amount of traffic either staterd or finished its journey in Kinlochleven, he replied that in 1961 ‘3,000 vehicles per day moved north and south, across or round Loch Leven’, This figure was roughly equally split between the ferry and Kinlochleven. All Goods Traffic on the Ballachulish Branch ceases, in anticipation of the forthcoming complete closure of the line from Connel. The vast majority of freight in the last few years had been related to the smelter at Kinlochleven, but this was transferred to road transport. At a meeting of the Oban Business and Professional Womens Club, the provosts of Oban and Fort William offered support for a bridge at Ballachulish as a means of improving links between their two towns, and they also promised to meet each other on the opening day of a bridge, should it happen in their lifetimes. They kept their promise a little over a decade later. Approval is granted in Parliament for the closure of the Connel – Ballachulish Branch Line. After the cessation of goods traffic the previous year, this is hardly a surprise. After the reduction to 3 trains each way after the war, the line is once more providing 4 services each way when closure is announced. However, the passenger numbers are substantially boosted by the 70+ school pupils travelling to Oban Grammar School each day, and as they enjoy subsidised travel, the costs of maintaining the line are too much since the loss of the slate traffic, and transference of much of the Kinlochleven Smelter traffic to road freight. The Secretary of State for Scotland was again asked about plans for the bridge, and he replied that he was awaiting a report. Following the debate about Moorings in Ballachulish Bay some years earlier, the matter was again raised, with the Minister of Transport asked how well used they were and what financial contributiuon was yielded. He replied that since the last question they had been used twice, totalling 15 days and yielding £24. The total maintenance cost over the previous 6 years for the 7 buoys had been £25,700! The last train services on the Ballachulish Branch line ran, with the line then closing completely from Connel. Soon after the closure, the Connel Bridge was opened fully to road traffic, with the subsequent cessation of the Bonawe ferry service. Tolls were also lifted from the bridge. On the final schoolday before the line closed, the school children who travelled by train each day gave the Guard a present which they had bought and paid for themselves. Just two days after the closure of the railway, track lifting began. Whilst it would seem logical to start at the Ballachulish end, and work back to Connel, so using engines and wagons to remove the rails and sleepers, photos of Ballachulish and Ballachulish Ferry Stations taken at Easter, in early April 1966, show the track still intact. This is believed to be due to the necessity of lifting the rails on the Connel Bridge to ease the passage of road traffic. The Secretary of State for Scotland was again asked about plans for the bridge, but he said he had nothing to add since he was last asked. The Postmaster General was asked about the VHF Station at Ballachulish, and he replied that it was a matter for the BBC, and they hoped to complete the work before the end of 1967. 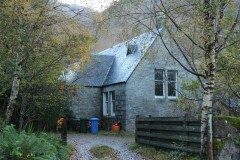 All of the former British Rail land in Ballachulish, at least as far as St Johns Church, was bought by Jimmy Chisholm. He used much of the station site to develop his garage business, the trackbed between the platforms was filled in with slate waste, and other parts of the site were tidied up. Some of the land has since been gifted or sold for community use, such as the tourist information centre and car park area. The family have also been selling the land on as housing plots almost ever since. At the end of the 1966/7 School year, St Johns School was closed. For the last year there had been just 21 pupils on roll, and those who were still of primary age were transferred to other local schools – a number moving to Glencoe village school which was still an Episcopal School. The pupils had all been given admission numbers, the highest being 468, although judging by the number of pupils recorded back in 1879 this cannot have been since the school opened. Perhaps they only ever used 3 digits. 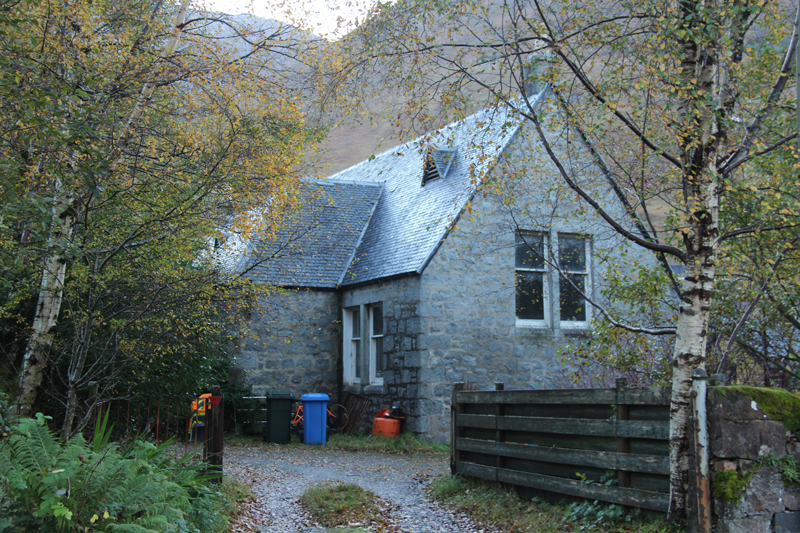 The School was retained by the church and used as a church and community hall until the Ballachulish Village Hall opened in the mid 1980s, after which it was sold and converted into a home. The Secretary of State for Scotland was again asked about the construction of a bridge, this time a toll bridge. He replied that he was awaiting a report from engineers, and hoped to be able to make a decision by the end of the year. Whilst it was another 3 or 4 years before construction began, it was reported that in 1969 preparatory works had commenced. This could have been no more than geological surveys to assess the bedrock conditions for foundations, following on from the report mentioned above. The last new ferry for the crossing was introduced in 1969. In contrast to recent history, the vessel was built at Troon on the Clyde, and was apparently built by apprentices. As such it was the only steel hulled vessel ever to carry cars at Ballachulish, perhaps explaining why it is still in service, at Glenelg, nearly 50 years later.